Why not send a note for the visitors page? FOUR village girls joined a chart-topping 60s band on stage at The Royal Albert Hall in London. Reg Presley, lead singer of The Troggs, best known for Wild Thing and the original version of Love Is All Around, wanted something special for the last night of the band’s tour. So he called in a talented young quartet of string players from Knebworth, who duly appeared with the band. Katriona Guilhaumaud, 16, Sarah Burrell, 16, Felicity Corrie, 15, and Sarah Pateman, 16, were drafted in to help recreate the original Troggs sound. Undaunted by the prospect of playing in front of an audience of 3,700, the girls thrived on the responsibility of being The Troggs’ first live strings accompaniment since 1968. Katriona said: “We were all made very welcome by all the groups and we thoroughly enjoyed it. The Troggs’ drummer Dave Naggs was certainly impressed with the girls’ performance. 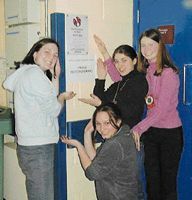 All four girls are members of both the Hertfordshire Schools Symphony Orchestra and the North Herts Youth Orchestra. Katriona’s next live performance will be at the Hollybush Folk Club, at the Hollybush pub, in Redbourn, tomorrow.